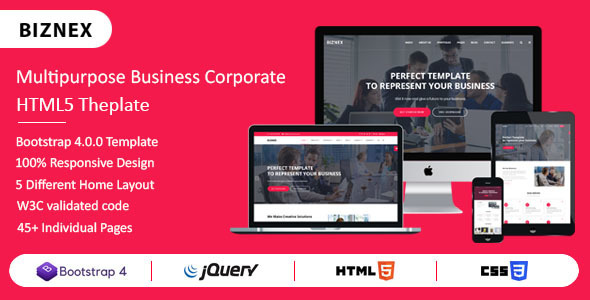 BIZNEX is a premium HTML5 template for Multipurpose websites which is built with the twitter bootstrap (version: 4.0.0). This template is suitable for any agency, business, corporate company, business agency, digital agency, start up business and much more. The whole template is made with excellent responsiveness. It provides EIGHT (5) different layouts of HOME page. It also contains 49 individual HTML files with 100% responsive & W3C HTML validate coding. All HTML & CSS codes are commented properly so it’s easily customizable. Properly commented in HTML & CSS codes. The template made with twitter bootstrap framework (version 4.0.0). And some jQuery plugin to give a nice look and functionality. We use Google Font, Flaticon, Font Awesome Icon to make the template. You must have to keep all these dependencies if you wish the template work same to you as preview. All images are available only DEMO are not it download package.